In traditional Chinese medicine the prevention and treatment of diseases by taking common foodstuffs is called "dietotherapy" or " medicinal foods." Dietotherapy is a gem in the treasure house of Chinese medicine. For countless generations it has shown forth never waning. Chinese dietotherapy originated among the common people. Through the ages this wisdom has been distilled and improved by doctors, and handed down from ancient times. There are several distinct advantages to this method: The basic foods are easily acquirable; the food itself is easy to make; it is safe; and it often can affect a cure. Accordingly, dietotherapy has been much appreciated by people in China, and with the increasing contacts between China and other lands, it is being more and more welcomed abroad. This book systematically describes the history of Chinese dietotherapy, tells how to make medicinal foods, introduces the varieties of medicinal foods and explains the proper method of consumption. Dietary treatments for 42 common illnesses are described and more than 100 kinds of medicinal foods are explained in detail. The reader can thug compound and apply the foods as their own condition requires to achieve a cure and greater health. 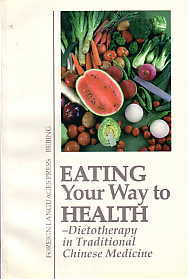 Eating Your Way to Health (English edition) has been very well received "Since its publication in the 1980s. In response to reader demand for more information, a revised edition with double the contents of the first edition is published.